Bill & Ted's Excellent Adventure? No, that's Theme Park Mystery. Weird game. CaptainD is correct, and yeah, weird game indeed. It was also out on PC but I think the Amiga version is best known. I remember playing the demo on the Atari ST. Wow... that was a long time ago! I really can't guess that! Heh... no. Albert Einstein was just the character you play against in a board game in this budget release for the Speccy. I always wanted to play this but never got the chance. Guesser is also obliged to say if it's any good. Looks nice! Unfortunately I have no idea what it is. YES! And your opinion of it? Did you play it? Can't remember the game... I did remember that freaky eye and the graphic style (I think I've played a demo about twenty years ago). This reminds me very much of Winter Events on the C16 (though I suspect this screenshot is from the C64) - by Anco?. Or possibly Winter Games by Epyx? 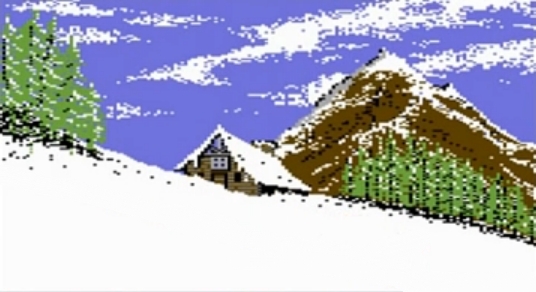 Yes, it's from Winter Games (C64). For its time, this was a pretty amazing game.